For years I have been wanting to make my own deodorant. First of all, I think making your own anything is empowering. Secondly, I would cringe every time I reached for a stick of deodorant off the shelf at the store. Seriously. Have you ever taken a look at the ingredient list? But I didn’t think I could do it. I needed empty deodorant canisters. There’s no way I would have all the ingredients in my pantry. I would have to buy all the ingredients or find them at the store. And with little kids, what could be a quick in and out of the store would turn into an hour-long ordeal. So I finally took the plunge. I was packing for a trip and went to pack my deodorant. But I couldn’t do it. The thought of putting those chemicals on my skin again made me sick to my stomach. I know that sounds silly, but it was the truth. I had tried most of the store-bought deodorants and they didn’t work for me. I was stinky by the middle of the day. That was unacceptable on so many levels. I’m not so sure that the time to test out a new deodorant recipe is right before your family travels with your husband on a business trip to Florida, but I was up for the challenge. 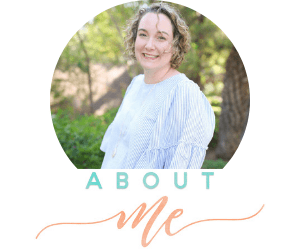 Actually, I didn’t think about the fact that I could possibly be stinky from the deodorant not working and that being the time I would run into my husband’s boss or the CEO of the company. Yikes! Of course, I was also procrastinating because I dislike packing. But the kids were napping and I needed deodorant, so it seemed like the perfect time to just make it. And I didn’t need a deodorant container. I used a shallow canning jar. Perfect! 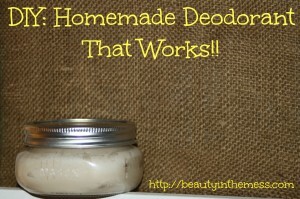 Homemade Deodorant That Really Works! Cream the first three ingredients together. Add the essential oil of your choice, and mix well. Then you can scoop the mixture into the canning jar or container of your choice. If you are going to put the mixture in canisters, then you want to melt the coconut oil and beeswax on the stove and mix in the powders. Take off the stove and add essential oils, mixing well. Pour into canister and let set. And guess what? It worked!! 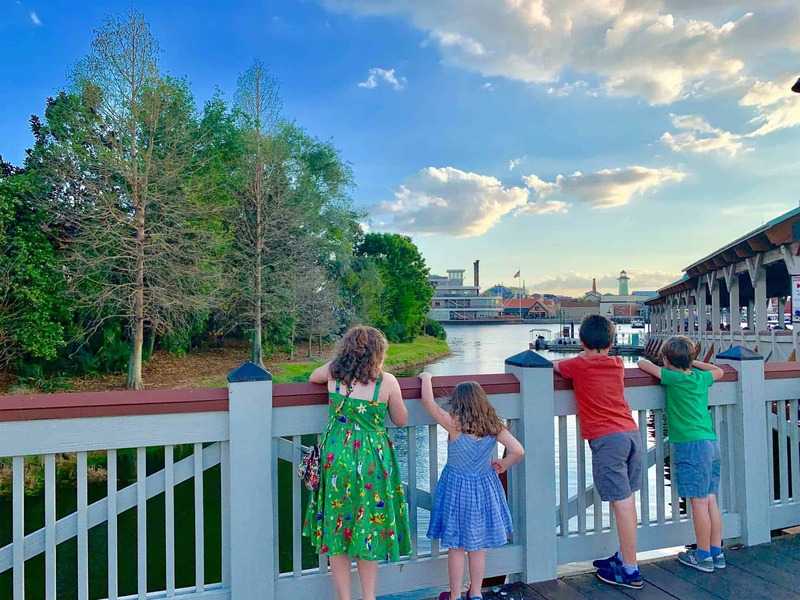 Only one day did I get stinky, and that was in the evening after a day corralling kiddos at Walt Disney World. I would say this was a success! I can’t believe I didn’t try it earlier. The first time I made the recipe, I melted the coconut oil and stirred in the arrowroot powder and baking soda. As I got to the bottom I noticed my underarms becoming irritated. I’m pretty sure the powder settled as the coconut oil cooled in the jar. By creaming the ingredients together and putting it in a jar, if I need to add more baking soda, I can. The consistency is softer than the version I melted. But so far no stink :). I used this at the beach, and while my jar of coconut oil got runny and melty, this deodorant did not! It was softer but never melted. Yay! Previous Post: « Baby Basics: What else? I made this, and put a little bit in 2 lip balm pots. I put the lip balm pots in my purse. I call it my emergency purse pit paste. Sometimes it’s super hot, you’ve been chasing kids, dogs, cats, farm animals all day and realize before getting out of the car in the grocery store parking lot that perhaps you could use a freshening. Voila – tiny pot of pit paste to the rescue!! Love your idea of creaming the oil and powders together! That is an excellent idea!! I have some little pots like that. I’m going to have to make some “emergency purse pit paste”. Love this idea!! The question I have is, what does it do to your clothes? I haven’t had any issues with staining. My clothes look the same as they did with store bought. Although I have notices I don’t get the white residue when I put black or dark colors on. I hope that helps! Thanks that is what I was wanting to know. My dd has struggled with her clothes getting ruined by armpit staining. Do you just apply it with your fingers then? Also, where is the best place to find the arrowroot? This looks great though, thanks! I do apply it with my fingers. I buy my arrowroot powder from Bulk Herb Store, but I bet Amazon would have it too.